The May WER report examines the timing of future production floater contracts given the continuing rebound in crude prices, highlights several developments that could suggest a reversal of Petrobras’ downturn is underway and provides our assessment of the likelihood that 17 FPSOs now being marketed for redeployment will land field contracts over the next few years. 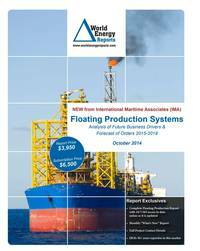 In the data section of the report are details for 243 floater projects in the planning stage, 58 production or storage floaters now on order, 278 floating production units currently in service and 36 production floaters available for redeployment contracts. Charts in the report update the location where floating production and storage systems are being planned, operating, being built and to be installed. Accompanying excel spreadsheets provide the report data in sortable format. Information is current as of 20 May.